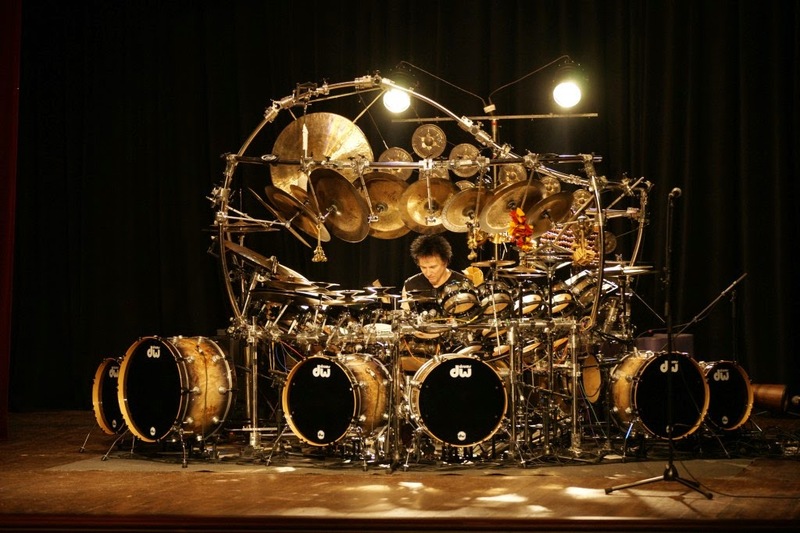 MuzikMan's Reviews And News: Drum Legend Terry Bozzio Presents a Solo Musical Performance on World´s Largest Tuned Drum and Percussion Set on Forthcoming North American Tour! Drum Legend Terry Bozzio Presents a Solo Musical Performance on World´s Largest Tuned Drum and Percussion Set on Forthcoming North American Tour! Los Angeles, CA – Drum legend Terry Bozzio, known for his work with Frank Zappa, Jeff Beck, UK and his critically acclaimed solo ventures, celebrates the 50th anniversary of his first drum lesson with “An Evening With Terry Bozzio” coast-to-coast North American tour! During the course of this tour, Terry Bozzio will hit over 40 cities from San Diego to Jacksonville to Montreal to Vancouver to Los Angeles and everywhere in between. This will be a night of solo drumming and include compositions from throughout his career, as well as improvisation. It is by no means a clinic or a workshop. Enjoy an intimate evening of Terry Bozzio and his monster sculpture of a drum kit together for the first time in seated venues across North America. “TERRY BOZZIO - An Evening of Solo Drum Music” is a unique, intense, dynamic, spiritualistic, melodic, orchestral, atmospheric, and musical performance on the largest tuned drum & percussion set in the world. Unless you have seen Terry, you have no idea what you are in for. Bozzio is an enigmatic, evocative, and engaging musician whose instrument just happens to be the drums. Terry Bozzio is able to accompany himself with bass note patterns and, at the same time, melodically solo on top with highly developed coordination skills to express a complete musical statement on the drum set alone. Drawing from jazz, classical, & ethnic percussion styles from around the world, Terry Bozzio is “a storyteller,” able to weave a hypnotic spell over audiences and enthrall them with an eclectic experience filled with contrast, variety, intimacy, excitement, & passion. Terry has had tremendous success with his last two Terry Bozzio solo drum performance tours in Europe (2012 included his headline show at the Jazz Festival Frankfurt – the oldest jazz festival in the world – and 2013 which included sold out performances in Sweden, Germany, Eastern Europe, and France). Please note that this is not a bombastic 2 hour drum solo. This is MUSIC on drums, “an evening with Terry Bozzio.” In most of Bozzio’s works, he accompanies himself with bass lines while soloing over it melodically on the tuned toms. There is space, classical forms & structures, ambient electronic loops, and atmospheric percussion effects, as well as some exciting & fiery drumming that brings audiences to their feet! In other news, Over the last four decades, drummer Terry Bozzio has built an extraordinary legacy based on his unique approach to rhythm and the diverse and acclaimed recordings to which he's contributed. On April 18, 2014 he'll go beyond genres into new mediums with the release of an art collection titled [RHYTHM] + [SKETCH]. Available exclusive at www.terrybozzioart.com, the collection is a fusion of artwork crafted over the last three decades mixed with new abstract visuals made from capturing rhythm. A project that began a year ago, [RHYTHM] + [SKETCH] is a highly limited release of artwork on canvas. The collection's visuals are a unique fusion of ink sketches Bozzio has made throughout his career, as well as his take on the new medium of rhythm-on-canvas, a process of creating abstract artwork through the documentation of rhythmic performance and light movement. To build the collection, Bozzio joined Los Angeles art team SceneFour in the creation process. SceneFour is the team responsible for the rhythm-on-canvas movement, working exclusively with the world's finest drummers to craft abstract artwork from performance. “Terry's collection is a remarkable step forward. His style is so unique that once captured the arcs and techniques he's mastered become crystal clear to a discerning viewer,” SceneFour's Co-Founder Cory Danziger states. “The fusion of Terry's sketches into the rhythmic creations is a natural. His work behind the kit has similarities to the artwork done by hand. It's very telling of how his creativity is consistent even as it crosses platforms.” In total, twelve different works are featured in Bozzio's collection, with a limited number of each piece available to the public on April 18, 2014. Each piece is numbered and signed individually by Bozzio. To join the interest list to learn more and see it before the release, sign up at www.terrybozzioart.com. Terry's stage setting for his upcoming solo drum tour will include large pieces of his [RHYTHM] + [SKETCH] work as a backdrop on the stage.